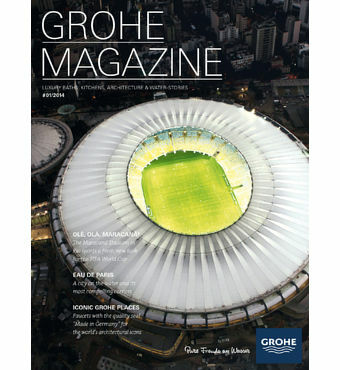 The first-ever GROHE magazine for consumers is out. Available at GROHE showrooms around the globe, the journal brims with exciting stories and inspiring photos from the multi-faceted world of water. The approximately 100 page magazine, which is published twice annually in nine languages, has a circulation of 520,000 copies. Highlights in the first issue include a travel guide to Paris focusing on items of interest related to water. From spectacular fountains to a nightclub on a boat, from a floating swimming pool to a unique aquarium, the new GROHE Magazine is packed with insider tips, some of which come courtesy of Oliver Jahn, the editor of Germany’s Architectural Digest magazine. Lovers of unique architecture and modern interiors will devour the project reports from all over the globe. For all those who cannot travel to the FIFA World Cup themselves, a feature on a stadium in Rio de Janeiro offers an exciting insight into the latest off-pitch designs. Hotel stories from places as far afield as Vietnam and Canada stir readers’ desire to travel. Music fans can look forward to a tour of the legendary Abbey Road Studios where such artists as Adele and Liam Gallagher benefit from the washroom comforts afforded by GROHE water fittings. Readers will also learn what makes the world’s leading manufacturer of branded faucets and fittings tick. An interview with Thomas Fuhr, the GROHE Management Board member in charge of technology, provides insight into the precision work at all GROHE plants and their commitment to the highest standards of quality. In addition, Paul Flowers, head of design at GROHE, shares his views of modern consumer-centric design.